In just a few months, we’ll be flocking to the nurseries and garden centers hunting for the perfect plant. We’ll look at flowering color and form, leaf texture and color, and hopefully consider sunlight and moisture requirements. When searching for that perfect shrub or tree, remember where we live. 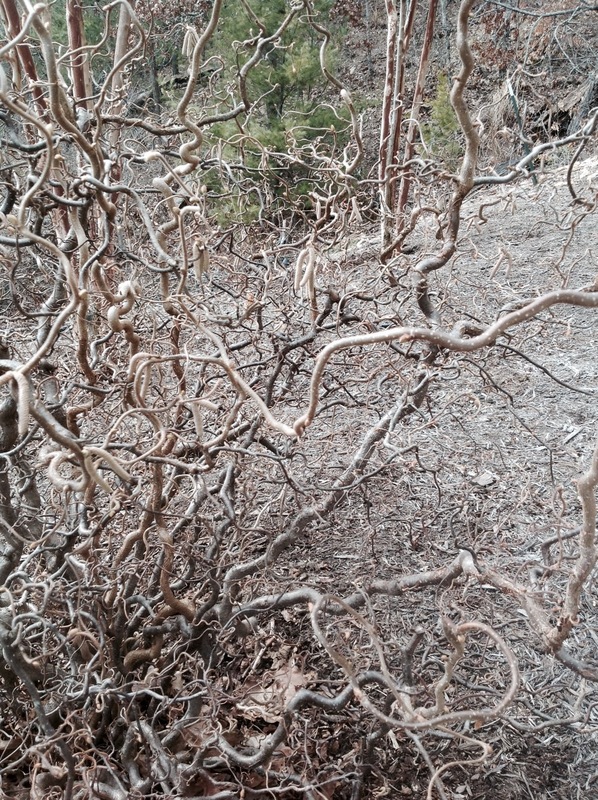 Our deciduous trees and shrubs are without their leaves almost half of the year. To make the garden more interesting in those months, think about the plant structure, color and texture of the bark, and berries that will be a focal point in a dormant garden. Now is a time to visit nurseries to see the plants without their foliage. Of course, their stock of plants is less during the non-growing season. 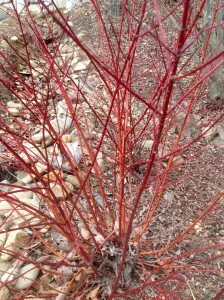 There are many beautiful winter interest plants. Here are a few of my favorites. 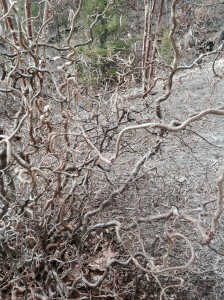 Harry Lauder’s Walking Stick (Corylus avellana ‘Contorta’) has twisting contorted branches giving it a sculptural effect in the garden. Plant it where it can be admired and grow into a small tree or large shrub. It prefers full sun to a little shade. It also has yellow catkins that hang from the branches in late winter. Its summer leaves are coarse and dark green. Another plant is magnificent when planted as a mass. 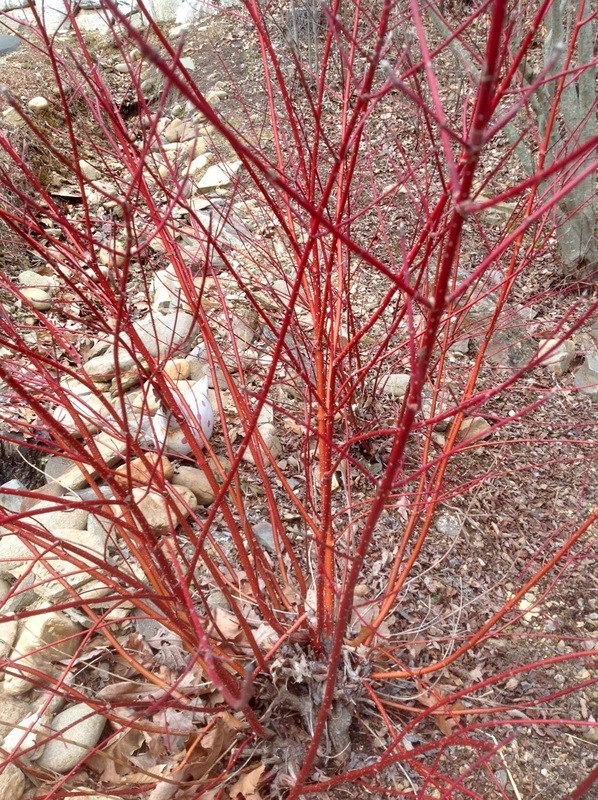 The red or yellow stemmed dogwood (cornus alba and cornus sericea) have brightly colored stems true to their name. 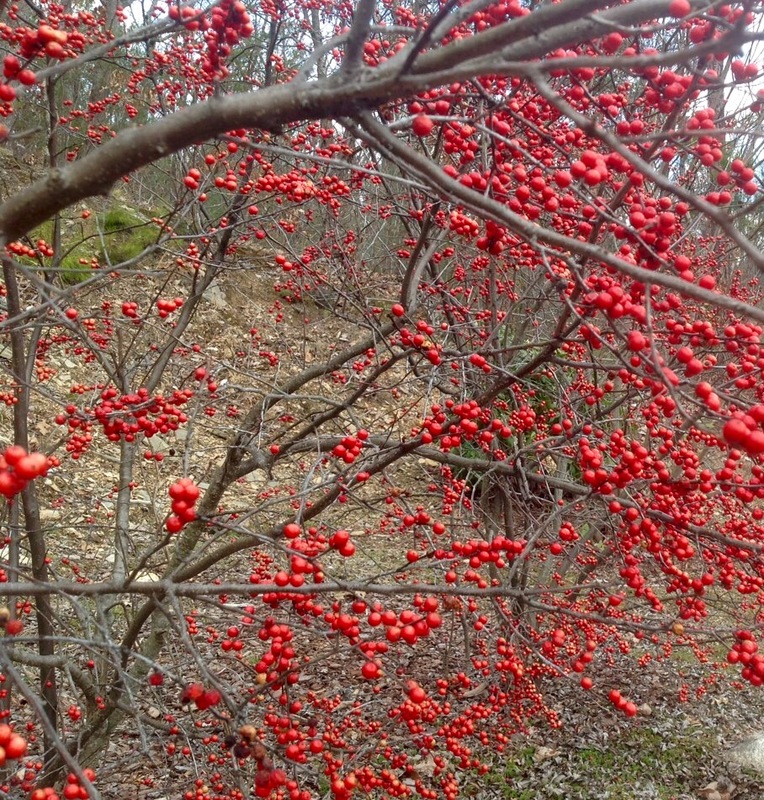 In the summer they are just shrubby plants that reach 5 to 9 feet tall, but in the winter, the brightly colored stems stand out in a gray landscape. When planted in a group of one color, the effect is intensified. 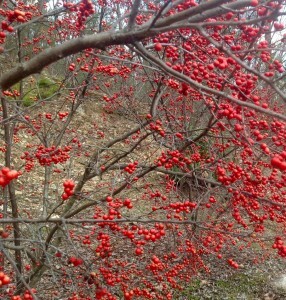 Winterberry (Ilex verticillata) a 6 to 15 foot tall shrub native to the eastern US, has bright red berries that hang on throughout the winter. That is if the bears or robins don’t eat them. A single male plant is needed among the females. Sun to part-shade and adaptability to many types of soil, including wet areas, make it suitable for many gardens. There are also many different conifers that give interest and color in the winter garden. When winter is finally over and the urge to dig and plant returns, don’t forget those lovely plants with winter interest. You’ll be glad next winter.